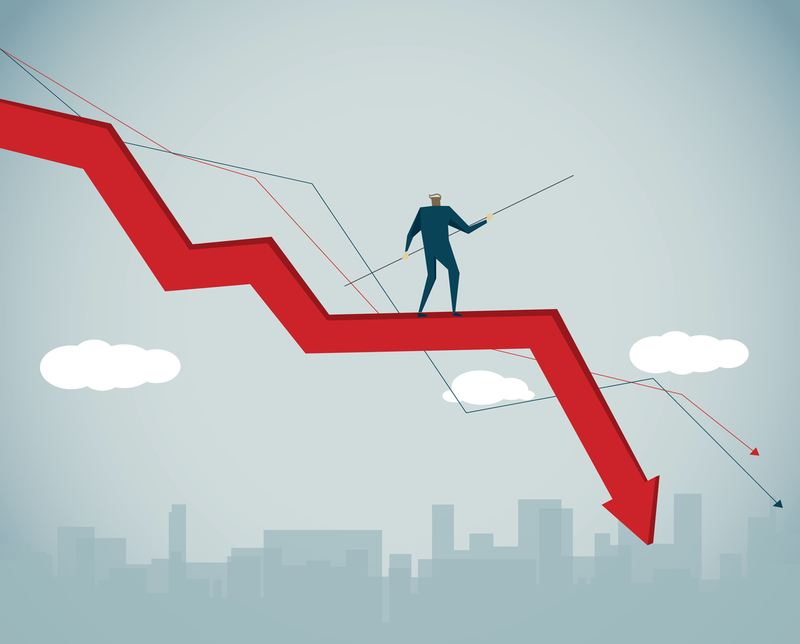 Most analysts agree that a housing boom and bust were the main precipitating factor behind the deep economic crisis, now known as the Great Recession, which took place a decade ago. And while there is no universal consensus on what caused the housing boom and bust, these events have, understandably, sparked many economists’ interest in theories that financial market imperfections allow for excessive volatility in asset prices that then lead to major fluctuations in aggregate output and employment. 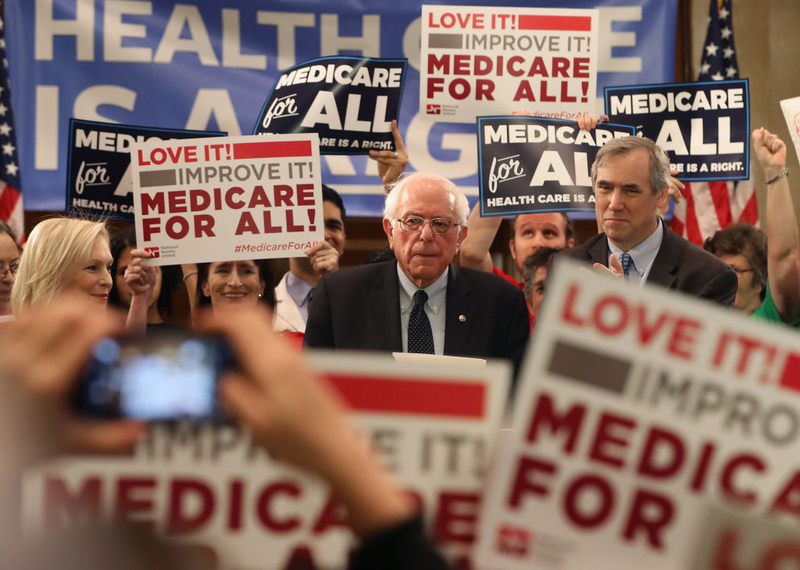 Like older Keynesian theories, these new models typically suggest that government policy intervention is needed to curb risk-taking in financial markets and, more generally, to counteract swings in consumer and business sentiment. A few other economists, however, have described channels through which government policies themselves may have created, or at least amplified, the large fluctuations in home construction and prices that preceded the Great Recession. These alternative theories suggest instead that price movements generally operate, within a free market system, to stabilize the economy when it is hit by disturbances to aggregate supply and demand. Large disruptions to economic activity occur only when policy mistakes work against the price system, transforming what would otherwise be mild cyclical fluctuations into more extreme booms and crashes. Here, we outline some arguments and evidence to support this view, that the Great Recession was not the inevitable consequence of unstable asset markets but followed, instead, from a series of unfortunate government policy mistakes. In a 2007 paper presented at the Kansas City Fed’s Jackson Hole Symposium, John Taylor of Stanford University presented evidence of a strong statistical connection between data on housing starts and the federal funds rate over the decade leading up to the crisis. Because the federal funds rate is the interest rate under the most direct control of the Federal Reserve, this correlation points to monetary policy as a potentially destabilizing force during the boom-bust episode. Some economists question this interpretation of the data, arguing that the short-term interest rates under the Fed’s control have little connection to the longer-term mortgages that finance the purchase of new homes. A 2010 New York Fed working paper, however, explains that banks and other mortgage providers borrow funds on a short-term basis to make longer-term loans. Their activities open a channel through which policy-induced movements in short-term rates strongly affect the profitability of lending and thereby affect the mortgage and housing markets. Other statistical indicators of housing-sector activity display strikingly strong correlations with the federal funds rate. 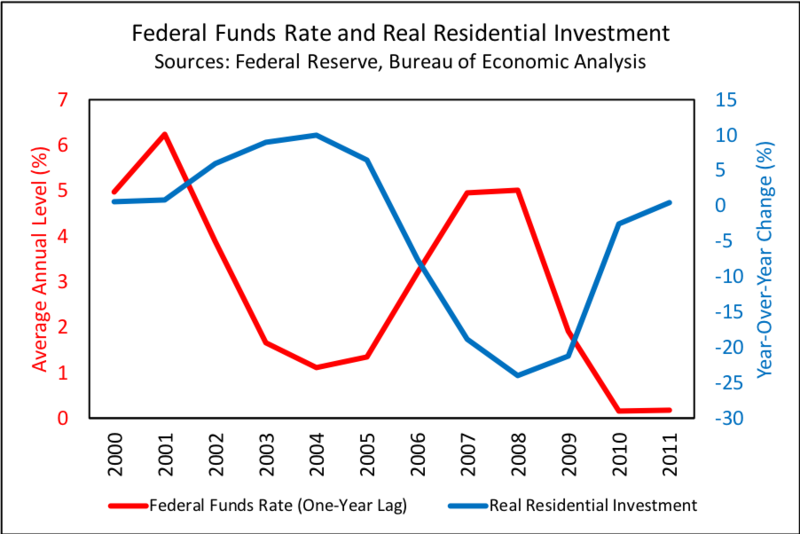 The first figure below shows that rapid growth in residential investment over the period from 2003 through 2005 was preceded by very low settings for the federal funds rate. Then, a sharp decline in residential investment in 2007 and 2008 followed a period of higher federal funds rates. 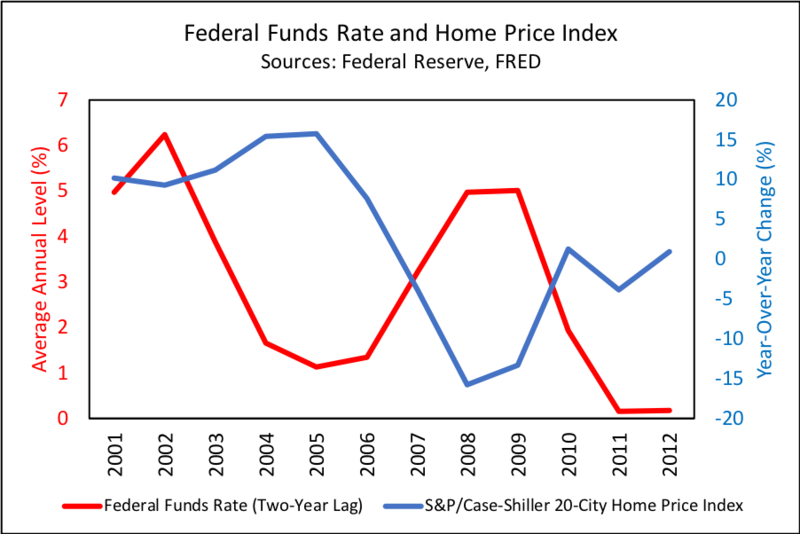 The second figure displays a similar inverse correlation between lagged values of the federal funds rate and subsequent changes in the Case-Shiller home price index. These correlations are consistent with traditional accounts of the manner and timing with which monetary policy disturbances affect economic activity. Unusually accommodative policy leads, first, to an “overheated” economy, as artificially low interest rates encourage excessive spending on durable goods and, later, to higher rates of price inflation. Conversely, overly-tight policy that keeps interest rates too high works initially to choke off capital spending and subsequently to lower inflation. Of course, other forces were also at work during the housing cycle of 2003 through 2008. 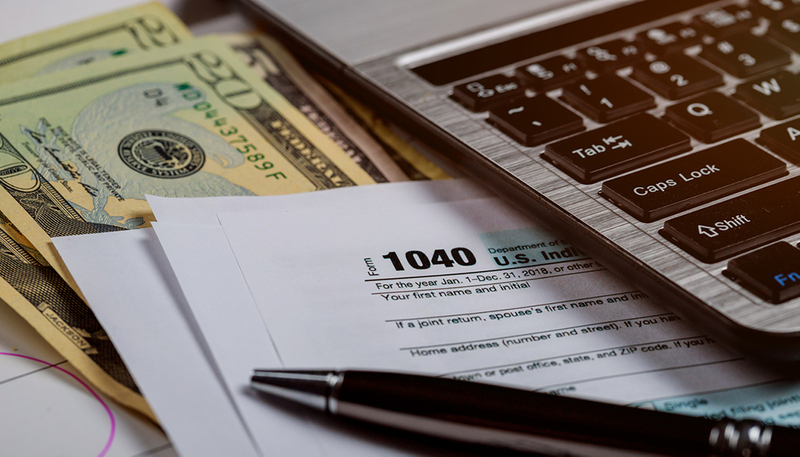 A very recent article on the government sponsored agencies argues that federal subsidies to mortgage borrowing and lending, offered through the now-bankrupt Fannie Mae and Freddie Mac, introduced volatility and fragility into the U.S. housing market before the crisis. Nevertheless, the correlations shown in the graphs suggest that a prolonged episode of monetary policy that was at first too accommodative and then too tight at least contributed to and may even have been one of the principal causes behind the housing boom and bust that led to the Great Recession. 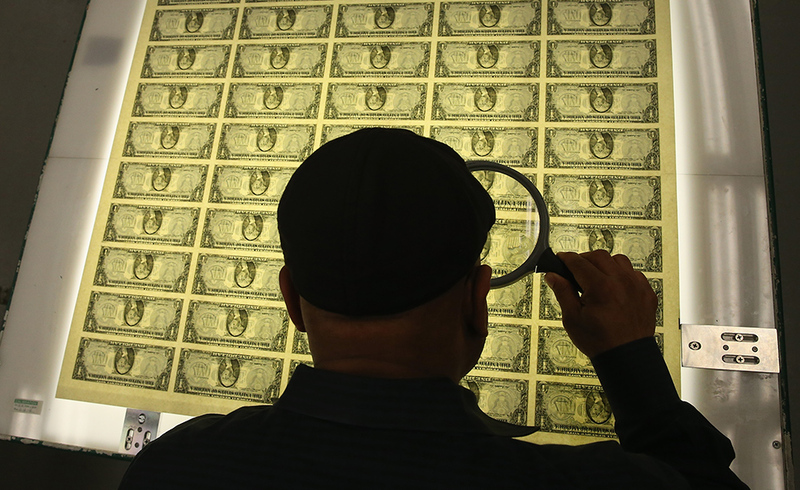 Future research by economists, historians, and political scientists will undoubtedly sharpen – and may even change – our view of what caused the Great Recession. At present, however, our best bet is that the crisis was not the inevitable consequence of inherent instability in US asset markets. Rather, both the recession and housing crisis that preceded it appear to have been the unintended consequences of government policies that interfered with the workings of the price system and destabilized what would otherwise have been much more efficient markets. 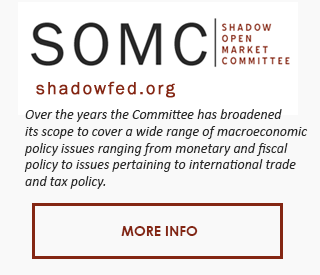 Peter Ireland is a Professor of Economics at Boston College and a member of the Shadow Open Market Committee. Darko Oračić is an economic analyst at the Croatian Employment Service; his views expressed herein do not necessarily reflect the views of that institution.